The four training plans contained within this packet details 27 weeks of training specifically designed to prepare Military Athletes attending the Civil Affairs Selection, the Civil Affairs Q-Course, and the final physical training gates immediately following the language school portion of the course. 1. Military OnRamp Training Plan – 7 Week training plan designed to establish base fitness for the follow-on plans. 2. 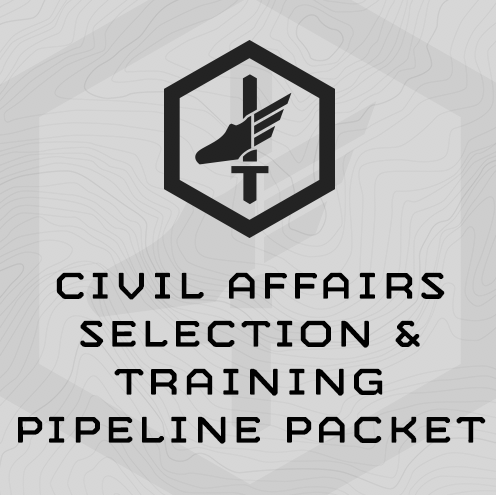 Civil Affairs Selection & Assessment Training Plan – 8 Week training plan designed to prepare soldiers for the rigors of the Civil Affairs Selection and be completed the 8 weeds directly before selection. Includes rucking progressions, APFT work, 5-mile run work, and long rucking days. 3. Civil Affairs Q-Course Training Plan – 6 Week training plan which will prepare soldiers for the physical training standards upon entering the course, as well as work to prepare the body for long patrolling and small unit tactics training with gym based endurance and work capacity efforts. Designed to be completed post-Selection and the 6 weeks directly before starting the Q-Course. 4. Civil Affairs Post Language School Training Plan – 6-week training plan to regain rucking and running fitness before completing the final ‘gates’ immediately following Language School. Strength and work capacity are employed for full body durability as the soldier prepares for beyond the training pipeline. Designed to be completed during the final 6-weeks of Language School.